According to Jewish historians, the Roman Empire came to be identified with Esau and “Edom”. In medieval rabbinic writing, “Edom” is used to refer to the Byzantine Empire. According the Jewish historians, Romulus, the founder of Rome was from the line of Esau. The basic legend about how Romulus came to be the first king of Rome begins with the god Mars impregnating Rhea Silvia, who was daughter of deposed king. This was from the line of the Trojan Kings who ruled from Alba Longa. After the birth of Romulus and Remus, the king orders them to be left to die in the Tiber River. When the basket in which the twins were placed washes up on shore, a wolf suckles them until a shepherd Faustulus finds the twins and brings them into his home. Latin for prostitute and she-wolf is lupa. They were probably raised by a prostitute. When they grow up, Romulus and Remus restore the throne of Alba Longa to its rightful ruler, their grandfather. Then they set out to found their own city. Sibling rivalry leads Romulus to slay his brother. Romulus started the town on one of the 7 hills of Rome called Palestine. Romulus then becomes the first king and founder of the city of Rome. Rome is named after him. After the fall of Rome, all Roman kings reigned out of Byzantium Empire in Constantiople the new Roman capital. The Byzantium included all of Italy all the surrounding coastal regions of the Meditterean Sea. Emperor Justinian regained many of the old Roman territories that the ermanic tribes had taken during the 3rd AND 4TH Century. That included the tip of Spain and North Africa which was taken from the Goths. Does the Bible talk about the Byzantium Empire? Number 24:24 identified the Byzantium Empire. Num 24:20 And he looked on Amalek, and took up his parable, and said, Amalek was the first of the nations; But his latter end shall come to destruction. Amalek was the leader among Esau’s princes. Num 24:21 And he looked on the Kenite, and took up his parable, and said, Strong is thy dwelling-place, And thy nest is set in the rock. Num 24:22 Nevertheless Kain shall be wasted, Until Asshur shall carry thee away captive. Num 24:23 And he took up his parable, and said, Alas, who shall live when God doeth this! Num 24:24 But ships shall come from the coast of Kittim, And they shall afflict Asshur, and shall afflict Eber; And he also shall come to destruction. Josephus, that ‘all islands, and the greatest part of the sea-coast, are called Chethim. This is talking about the Byzantine Empire. It control the Mediterrean Sea. The word Kittim is plural. God is trying to point to all of the Islands on the Mediterrean Sea and their coastlines. God is describing the Byzantine Empire. Kittim is the ancient name for the island of Cyprus. Chittim strong’s # H23794 means Cyprus. The Bible is telling you that the Island of Chittim is Cyprus. But Num 24:24 uses the plural form of the word meaning more than one island. This is explaining that the coast area in the Mediterrean Sea would conquer Eber who was ancient Spain –and Asshur is German and Austria. This is referencing the two parts of the Byzantine Empire. Spain was conquered by the Moors in the 7th Century and later initiated the Spanish Inquisition. Asshur is referring to the Hapsburg Dynasty. Num 24:24. is definitely talking about the Byzantine Empire. The Israelites were told they would go to war with Amalek EVERY GENERATION. Exo_17:14 And the LORD said unto Moses, Write this for a memorial in a book, and rehearse it in the ears of Joshua: for I will utterly put out the remembrance of Amalek from under heaven. Exo_17:16 For he said, Because the LORD hath sworn that the LORD will have war with Amalek from generation to generation. Who has the descendants of Israel gone to work throughout the centuries — Rome or the Byzantium. Parthia (a Israelite nation) went to war with Rome 13 times. The Germanic Tribes in Western Europe were consistently at war with the Byzantine Empire. Even in modern day, America and Britain during WWI and WWII fought the same people — the descendants of the Byzantium Empire. The Axis powers were Germany, Italy, Japan, Hungary, Bulgaria, Romania, Thailand, Finland, Iran, and Iraq. Notice how many of the nations sit in the old Byzantine Empire. 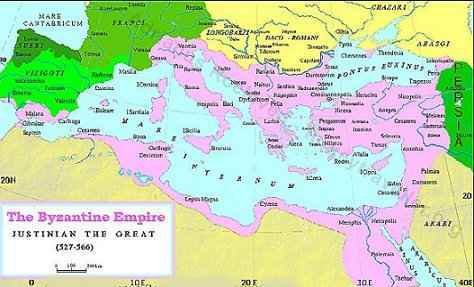 The Byzantine Empire make up the Modern countries of Algeria, Tunisia, Libya, Spain and Italy. Egypt, Syria, Jordan, Israel, Lebanon and Iraq, Romania, Bulgaria, Serbia, Bosnia-Herzegovina, Croatia, Macedonia and almost all other Balkan countries. According to the book of Jasher, Edom lived on the Island of Chittim.In the book of Jasher, we read that great battles arose between the children of Chittim and Edom. Edom was taken captive and mixed with the people on the island of Chittim which is Cyprus today. Esau Descendants also were in Turkey in the Taurus Mountains. They were called the Isaurians. Zeno was a Byzantine Emperor reigning from 474 to 475 AD. Zeno married the daughter of Byzantine emperor Leo I and fathered Leo II. The child reigned briefly upon the death of Leo I but died within a year and Zeno, having been appointed co-emperor, succeeded him in 474 AD. He was an Isaurian from the land of Isauria in Southern Asia Minor in the Taurus Mountains. The Isaurians carry the name of Esau. If take the name Esau you drop the “E” and replace it with an “I” You will have the name Isau. It is so extremely close to the name Esau. in ancient geography, is a rugged isolated district in the interior of South Asia Minor, of very different extent at different periods, but generally covering what is now the district of Bozkır and its surroundings in the Konya province of Turkey, or the core of the Taurus Mountains. He was called the “King of the Edoms”. According to Samaritan sources, Zeno (whom the sources call “Zait the King of Edom”) persecuted the Samaritans. (Procopius, 5.7). Also the Bible places Edom in the area above Turkey. He is identified with the area of Armenia located above Turkey. So it is not a difficult to believe that the Edomites were found in Turkey also. Targum Yehonatan (Aramaic Translation): “IN THE LAND OF UZ is Armenia”. Nachmanides (Jewish Historian) agreed he was in Armenia. The Byzantine Empire was ruled by the Isaurian from 711 to 802 AD. So the descendants of Esau controlled the Byzantium for almost hundred years. It is called the Isaurian Dynasty. Born c. 685 in Germanikeia, Commagene, he became a general. Rose in rebellion and secured the throne in spring 717. Repelled the Second Arab Siege of Constantinople and initiated the Byzantine Iconoclasm. Born in July 718, the only son of Leo III. Co-emperor since 720, he succeeded upon his father’s death. After overcoming the usurpation of Artabasdos, he continued his father’s iconoclastic policies and won several victories against the Arabs and the Bulgars. He is given the surname “the Dung-named” in hostile later chroniclers. General and son-in-law of Leo III, Count of the Opsician Theme. Led a revolt that secured Constantinople, but was defeated and deposed by Constantine V, who blinded and tonsured him. Born on 25 January 750 as the eldest son of Constantine V. Co-emperor since 751, he succeeded upon his father’s death. Born in 771, the only child of Leo IV. Co-emperor in 776, sole emperor upon Leo’s death in 780, until 790 under the regency of his mother, Irene of Athens. He was overthrown on Irene’s orders, blinded and imprisoned, probably dying of his wounds shortly after. The Byzantine Emperors are a royal line stretching from before the fall of Rome to the Hapsburg Dynasty. The Byzantine dynasties are link together through marriage. We know Esau’s descendants are tied to the Royal line through the Isaurian Dynasty. During the 11th Century a prominent family came to power called the Palaiologos. One of the Palaiologus rulers was Andronikos II (1259 – 1332). His son became lord of Montferrat through his heritance from his mother. His dynasty ruled in Montferrat. This inheritance was eventually incorporated by marriage to the Gonzaga family. Later, that succession passed to the Dukes of Lorraine, who became the progenitor of the Habsburg-Lorraine emperors of Austria. Also KONSTANTINOS XI (1448-1453) was the Byzantium Emperor during the fall of the Byzantium Empire to the Turks. His brother Thomas had a daughter named Zoë (Sophia) who married Ivan III of Russia. This links the line of Esau to the royal line of Russia. The Turks brought the Eastern Empire to a close in 1403 when they destroyed Constantinople. From that time, the Ottoman Empire ruled the Byzantine Emperor. The Ottoman Turks came from Turkey and Central Asia. The Mitanni Empire settled Central Asia. Mitanni was the descendants of Abraham’s children — Esau, Midianites (Kitarch’s children) and Ismael. Some aspects of the Eastern Empire were transferred to Imperial Russia under Ivan III (the Great) who was regarded as the first national sovereign of Russia. The Ottoman Empire existed for about 400 years and ended with World War I. The Ottoman Empire made up majority of the Axis powers in World War II (1939–1945) Axis powers (Germany, Italy, Japan, Hungary, Romania, Bulgaria, Greece, Iraq, Iran, Southeast Asia, Finland. History keeps repeating itself!!! The double-headed eagle is most commonly associated with the Byzantine Empire, the Holy Roman Empire, the Russian Empire and their successor states. AND HITLER. They were the same people. Also the Bible tells us that the Roman Empire or Byzantine Empire will be the Prince at the End time. Dan 8:19 And he said, Behold, I will make thee know what shall be in the latter time of the indignation; for it belongeth to the appointed time of the end. Daniel 8 talks about the little horn. Dan 8:21 And the rough he-goat is the king of Greece: and the great horn that is between his eyes is the first king. Dan 8:11 Yea, it magnified itself, even to the prince of the host; and it took away from him the continual burnt-offering, and the place of his sanctuary was cast down. Dan_9:26 And after threescore and two weeks shall Messiah be cut off, but not for himself: and the people of the prince that shall come shall destroy the city and the sanctuary; and the end thereof shall be with a flood, and unto the end of the war desolations are determined. The Temple had already destroyed during the time that Daniel wrote the prophecy. But this is also referencing the Herod’s temple. 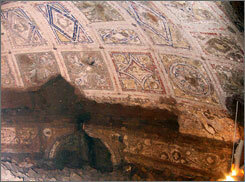 Roman was the empire that destroyed the temple during the time of Herod. God is trying to tell us who the people of prince is. It is the same people that destroyed the temple and city the first time– The Romans. He is telling us the Roman or Byzantium Empire will rise again at the end time and it will be the Kingdom of the Prince or Vial man of Daniel who destroys Israel. Also was not the only people from the Middle East found in Italy. Nermin Vlora Falaski, in its book “Linguistic and genetic heredities” has deciphered Etruscan and Pelasgic and linked it with the Albanian language today. This would mean that the Albanians who were also known as the Descendants of the Illyrians, were anciently called the Pelasgians, one of most ancient civilizations that lived Europe. Therefore, in Italy it exists the locality of the TOSCHI (the Tuscany), therefore as the Toschi lives in the “Toskeria”, in southern Albania. Herodotus (c. 450 B.C.) reports that the Etruscans came from Asia Minor. Herodotus says the Etruscans came from Lydia, in Asia Minor, as the result of a famine around 1200 B.C. Herodotus says the Etruscans came from Lydia and left and settled Italy. That is where we get the name Tuscany. Also Pliny the elder confirms the information of Diodorus. Virgil (Aeneid, VIII, V. 62-63), writes:“It is sayd that the first dwellers of our Italy were the Pelasgians”. Pelasgians were on the Island of Crete. In the “Odyssey” by Homer, Odysseus, mentions the Pelasgians among the tribes in the ninety cities of Crete. (Homer. Odyssey, 19.175–19.177 (Robert Fagles translation). The Pelasgians were also in the Aegean Sea. A stele from Lemnos, an island in the Aegean, shows writing that appears similar to Etruscan. The Bible called the Island of Crete Caphtor. It says that the Philistines would also live there. CAPHTOR (Heb. כַּפְתּוֹר, כַּפְתֹּר), place located either in the Aegean Sea area or on the southern coast of Asia Minor. According to Amos 9:7, Jeremiah 47:4, and possibly Genesis 10:14, the Philistines came from Caphtor prior to their penetration of southern Palestine. Deuteronomy 2:23 notes that the Caphtorim destroyed “the Avvim, that dwelt in villages as far as Gaza,, taking over their lands. The location of Caphtor or kftyw is in dispute. Most scholars consider Caphtor to be the ancient name for *Crete and the surrounding islands (cf. “islands” in LXX, Jer. 47:4). In Jeremiah 47:4 Caphtor is defined as an island. Furthermore, several verses place the origin of the Philistines among the Cretans (Ezek. 25:16; Zeph. 2:5), while elsewhere they are identified as coming from Caphtor. Philistine pottery resembles that of the Minoan and Mycenaean civilizations to the point that a material connection is beyond question. That puts the Philistines in the area of Crete and Greece. The Sea People probably drove out the person of Crete and Asia Minor in the 12th century. Or they may have left because of the famine that struck the region at that same time. Who really Discovered America? Did the Messiah Keep the 7th Day Sabbath? who had become “gentiles” in the diaspora and the disinherited Israelites in the Holy Land. Thanks I cover this information in detail in the history of the Maccabees and the 1st history account. Yes I am in agreement with your comment.